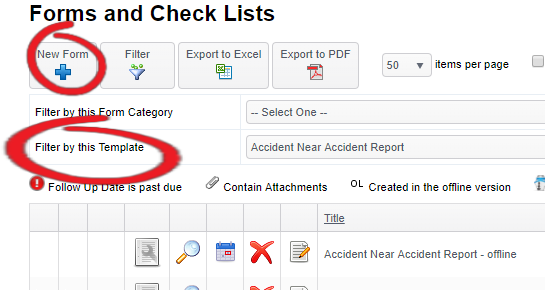 To create a form go to 'Forms' - 'Forms & Checklists'. This page will provide a table and will show all forms that have been created for this vessel. Pro Tip: Before your create a new form, quickly check that a form hasn't already been created by a colleague or crewmember. 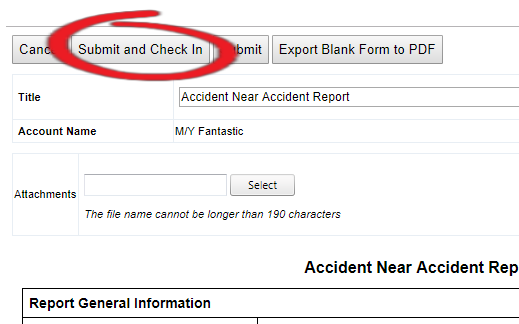 Pro Tip: if you have a particularly large form and want to save your progress, without generating an alert, click 'Submit' over 'Submit and Check In'. This will save your work and allow you return at a later date. However this should be used carefully as if you have not Checked in the form and click 'Cancel' all of your work will be lost!